Everything you need (plus a little extra) to be sharp right out of the box. We add value instead of charging for add-ons. From customized, interactive eReminders to online patient forms, it’s all included in MOGO’s dental practice management software. The MOGO Multi-Location feature allows you to sign in and access records across multiple office locations, all from one computer. With the ability to share patient data between offices, MOGO offers you the simplicity of including a patient in either one particular practice or multiple. Multi-Location offers you the benefits of centralized billing. One of the most beneficial features of MOGO Multi-Location is the Business Analysis Reporting dashboard. 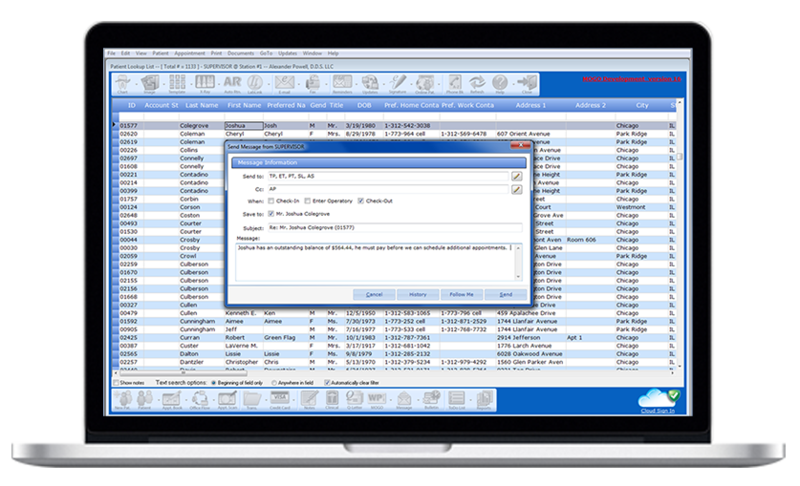 View all of your practices vital information from one screen. The reporting dashboard allows you view all of your office Production, Collection, New Patients and much more on one screen. Use Pie Charts, Bar Graphs and Line Graphs in the Business Analysis Report to compare your offices’ bottom line numbers. The Office Flow gives you an overview of patient appointments throughout all of your offices. MOGO tracks patient wait times, from checking in, treatment time and check out, which are demonstrated on the Office Flow and bundled per office and patient. 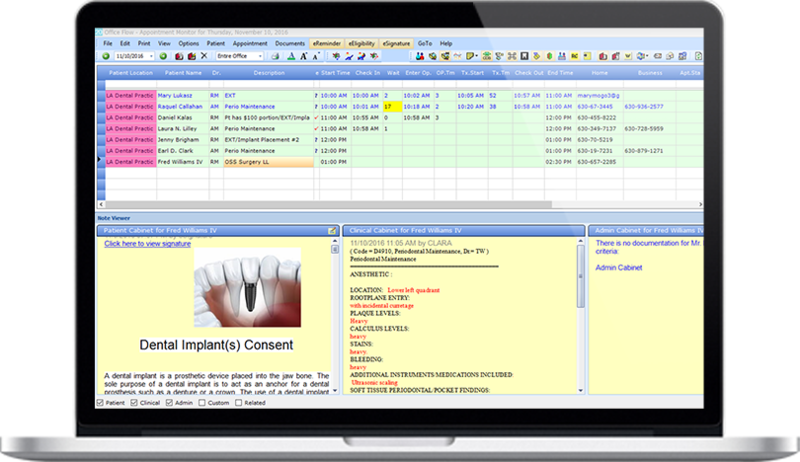 MOGO dental management software provides the maximum amount of information, logically arranged, on a single screen. From basic demographic information to medical alerts and insurance coverage, everything you need is available at a glance. Most other practice management systems do not have a legally binding signature. MOGO’s eSignature feature stores and encrypts the contents of any document. We use biometric data methods, such as measured pressure, speed, and stroke, making the document legally binding. Best of all, you can setup a timeframe to remind you to obtain an updated signed form. How a patient is greeted sets the tone for the entire appointment. While some front desk staff remember names and faces, most need a little help. With photos, audio pronunciations and personal notes, MOGO ensures the right personal touch. MOGO makes it easy to snap patient pictures with a simple webcam. Not sure how to pronounce that name? Record it and let MOGO play it back for you. Is there something that the patient is particularly proud of or a topic that should be avoided? Set a silent popup to display whenever that patient record is accessed. Whatever the situation, MOGO is there to help you provide the best experience to your patients. When your patient walks in, one click informs the rest of the team who’s here. You can even choose to have alerts display in the operatories, either audible or silent, to inform staff of any patients waiting. When family dynamics change, MOGO lets you quickly and easily update the family to reflect current reality and updated status, without losing any history or forcing you to create new accounts. Our dental management software combines dynamic family linking with live balances, eliminating the need for a traditional “family ledger”. Every balance in MOGO is calculated in real time, based on the treatment entered for each patient and any payments applied to that individual or their family. MOGO automatically tracks when the last statement was sent and when the next statement is due so you don’t need to worry about duplicates. Account balances are always calculated in real-time, so even if someone else is entering insurance payments while you’re sending, the information on the statement will be accurate and up-to-date. As an added benefit, weekly or daily billing evens out your cash-flow and makes everyone’s job more manageable. Save even more time and money by signing up for eStatements. Let someone else handle all of the printing, folding and envelope stuffing so you can get back to what really matters: your patients. Office messaging allows you to send messages throughout the office. If the patient mentions a payment or a need in the operatory, send a message to the front desk to make sure they are aware of the patient’s needs. Keep staff informed of meetings and other important reminders. Our Global messaging feature (included) enables staff away from the office to receive messages by text or email. Send Appointment Reminders, Appointment Confirmations, Reactivate Past Due Recall Patients and Send Birthday Wishes via text message or email for free. 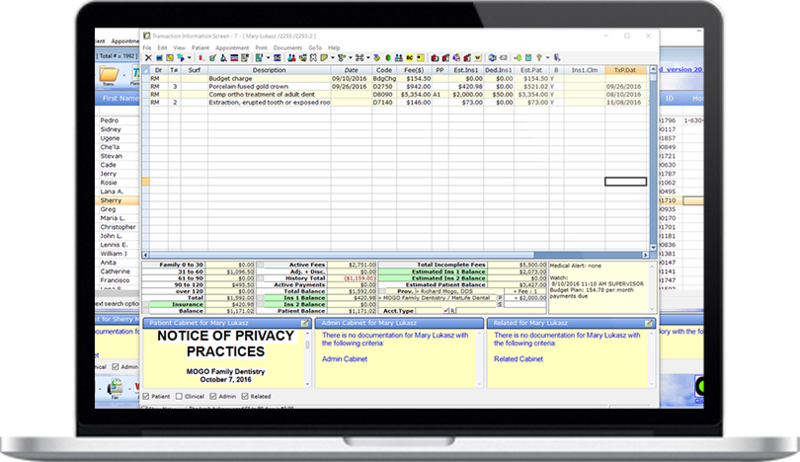 The eReminder system takes some of your most time-consuming office tasks and rolls them into one simple automated process. Recall cards, appointment confirmations, birthday cards and appointment reminders are automatically sent to patients with email addresses or mobile phone numbers. And even though eReminders are fully automated, you can completely customize the process to fit the needs of your office. You can even disable the full-blown automation if you want fine control over when or how many of each type of eReminder is sent. Are you short-staffed today? Appointment confirmations and reminders aren’t a problem, but Recall cards generate more calls than you can handle as patients try to schedule appointments. You can send some out in the morning, send some more out in the afternoon, and leave the rest for tomorrow. Every day, MOGO dental management software provides a list of patients who need to be contacted through traditional methods. Each patient is clearly labeled so you know at a glance why they’re on the list. If they’re missing an email address or cell phone number, you can get that information while you have them on the phone. If eReminders were sent and the patient never responded, you know that too so you can confirm the information you have on file. Of course, patients who opt-out of eReminders are also displayed on this list. Best of all, everything you need is built into the program so there are no extra modules to buy, no monthly fees, and no 3rd parties accessing your data. Other companies charge $3,000.00 to $5,000.00 annually to send reminders and greetings electronically, which cuts into your profit margin. You also have to leave both your database and internet firewall wide open to allow outside access making your data vulnerable. There are NO EXTRA FEES or third-party companies to deal with, patient communication is at its best, most efficient, and secure with MOGO’s integrated eReminders. With a customized setup, you may automatically send your reminders any time of the day. Choose from texting, email, letters, postcards, or even voice reminders, everything is automatically tracked and individually saved to the patient record. Patients’ confirmations are automatically retrieved and marked so you can see at a glance which patients have confirmed their appointments before the beginning of the day. The new automated Voice Reminders will call patients to remind them of appointments and when it’s time for a cleaning! Just set up your script and let Voice Reminders make the calls for you! After the appointment is scheduled, setup eReminders to automatically send out a reminder email or text message to remind patients of the upcoming appointment. Once the patient confirms the appointment by clicking on the CONFIRM button, it is automatically updated in your appointment book. Electronic birthday cards are a simple way to maintain contact with your patients between appointment. Once the patient confirms the appointment by clicking on the CONFIRM button, it is automatically updated in your appointment. 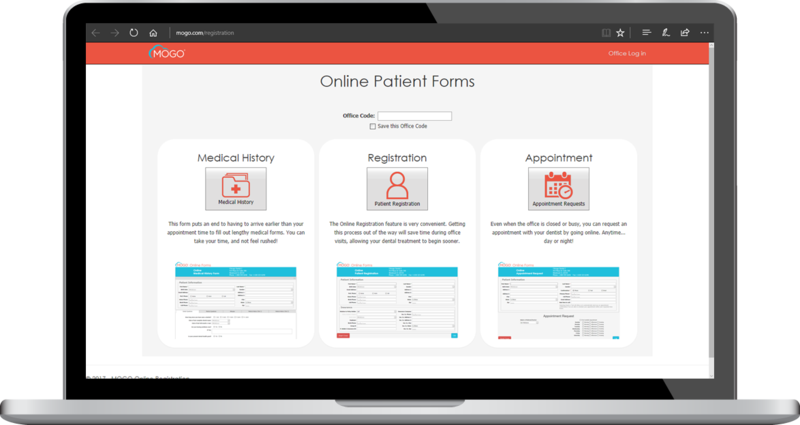 Save front desk time and attract more patients with MOGO’s online forms. Patients can register, request appointments, and fill out a medical history form. Patients can access secure forms from home with an access code provided by your office. Or forms can be filled in electronically in the office by kiosk or tablet. Capture the patient’s signature upon arrival using MOGO’s biometric eSignature feature. When a parent and two children arrive and all three have appointments, do you expect one payment or three? It seems like a silly question, but many programs expect you to split the payment and enter it three times if you want it applied to all three accounts. Not MOGO. We expect you to enter it one time under the account of the person who actually made the payment. Once the payment is entered, you can either specify which treatments are being paid as well as how much is being paid on each treatment or you can do nothing. MOGO will automatically use it to pay off the oldest outstanding family balance. MOGO was designed from the ground up with line-item billing built-in. If you pay by collection, you already know that this is an absolute must-have feature. Even if you don’t, it’s nice to have. How many times have you been asked how much insurance actually paid for a filling or crown? With MOGO, you simply locate the treatment and view its payments, quickly and easily. MOGO’s line-item billing makes paying service providers by collection quick and painless, too. When you’re setup to pay by collection, all of your payments are automatically entered under the practice. As the payments are used to pay off various treatments, collection automatically moves from the practice to the service provider on the current date. If a patient has a credit balance, it sits in the practice. One of two things will happen. You’ll either send the credit back to the patient or apply it to their next visit. If you send it back, the money comes out of the practice totals. The collection hasn’t been applied to anyone so no one is losing any collection. All you have to do is cut a check. If you apply it to the next visit, the collection shifts from the practice to a service provider on that date and is automatically displayed in the collection totals for the current pay period, regardless of the original payment date. All you have to do is run your normal collection reports and the money is there. 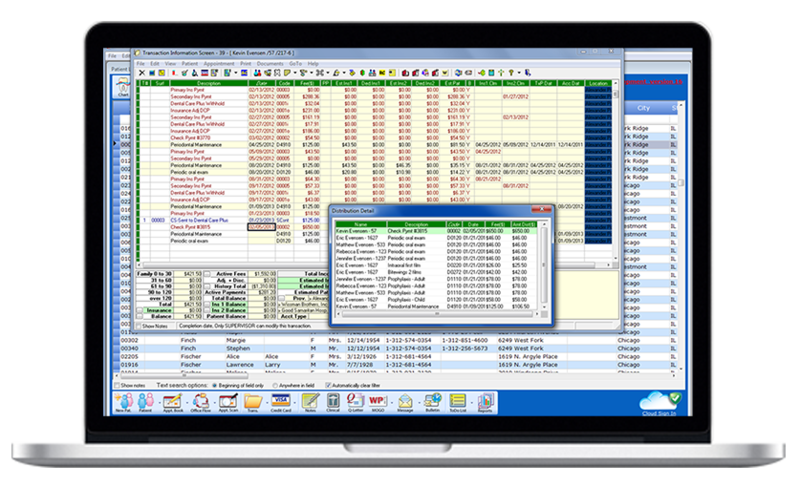 One of the most important tools in MOGO dental practice management software is the Office Flow. This screen summarizes everything you need to know about what’s happening with the patients in your office. At a glance, you know exactly who is here, whether they’ve been seated, and how long they’ve been waiting. Office Flow works with and expands upon the information in your Appointment Book to provide a crystal clear view of what’s happening in your office at any moment of the day. It also serves as a central hub for everything you need to know about a specific patient and helps drive patient care by providing helpful prompts and reminders in response to various events. For instance, when a patient arrives, a number of things automatically occur in the background: insurance eligibility is checked, documents that need to be signed are processed, announcements are sent to the operatories, and any messages that you’ve set up for this patient are automatically displayed. No one has to remember that the patient promised to pay a certain amount today or that they haven’t signed the treatment plan they accepted three weeks ago over the phone; MOGO remembers it for you. Many systems claim to protect your data, but only MOGO uses a truly secure, enterprise-level relational database, Microsoft SQL. Securing your database is just the first step. MOGO works with Windows security and various firewalls instead of working against them. All of MOGO’s communications occur on approved secure channels. We even talk directly with Windows to reduce the number of security warnings and User Account Control prompts you’ll see during the day. This lets you leave your Windows security settings alone, which keeps your computers safe and secure. Now that your data and computers are secure, we can start talking about pretty password screens. MOGO hasn’t used them in over 20 years. We have a pretty login screen instead. It seems like a small difference, but it’s actually huge. Login security is incredibly flexible. Instead of setting up hard boundaries, where one password grants access to some areas of the program and another password lets you access others, login security lets you pick and choose what a specific individual is and is not allowed to do or see. It also allows MOGO to track who is doing what. Without login security, an audit trail is completely useless. Any software can tell you that something changed. Most can even tell you what the change was and when it occurred. But what good is that information if you don’t know who changed it? The Daily Bulletin Board lists all of your employees and whether they are clocked in or out. It also shows the reason they’re gone so you can easily decide if you should wait, go find them, or get someone else. The Time Clock also integrates with the office messaging system. By turning on the “Follow Me” option, employees can have their office messages delivered via text message or email when they’re out of the office. All they have to do is clock out. From a management standpoint, the time clock is a huge time-saver. Open one report and you have everything you need to know before doing payroll. Do you need to know how much vacation time someone has left? Open the employee benefit summary and in addition to how much vacation they have left, you’ll also see what they started with, how much they’ve taken, and how much they have scheduled. Every feature included in one affordable package.